As the weather gets colder, Kentucky Refugee Ministries is in need of new and gently used winter coats, warm blankets, hats, gloves, and scarves for newly arrived refugee families. 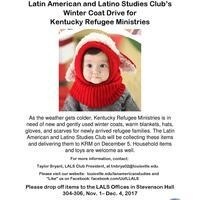 The Latin American and Latino Studies Club will be collecting these items and delivering them to KRM on December 5. Household items and toys are welcome as well. Please take donations to the LALS Program offices in Stevenson 304-306, Monday-Thursday from 9 a.m.-4 p.m.